A recurring theme in my letters is the various ways in which we can go about determining valuations for stocks and other investments. My good friend Steve Blumenthal has gathered a number of charts from various authorities showing different ways to look at valuations for today’s US stock market. He topped it off with some very good estimates of forward-looking returns on total US equity portfolios. He is not arguing to get out but rather to be aware of where we are and to temper your expectations for the future. Steve writes in an easy, fluid style that I think you will enjoy as this week’s Outside the Box. I’m in New York and on Monday was part of the closing-bell ceremony at the NYSE, where Monty Bennett, the chairman of a new public company (whose board I am on), Ashford Inc., rang the bell before we headed over to Bobby Van’s to hang with the Friends of Fermentation. I got to spend some quality time wioth my friend Art Cashin (more below). I went to the NYSE floor early to spend some time with Art Cashin and walk around.. It had probably been 10 years since I actually walked around the floor. I generally just head over to Bobby Van’s after the exchange closes, or Art comes to dinner somewhere in Midtown with “the guys.” I was really amazed at how different the floor felt this time. I’d been told and had read that the physical exchange is shrinking, but it’s hard to really understand that until you’re actually there. As I sat with Art later, marinating some ice cubes with the Friends of Fermentation, I commented on the changes. Art pointed out that physically there are 80% fewer people, both as “seats” and as support staff, than there was 10 years ago. That is an astounding number. He walked me up to one “post” where stocks were trading. In the past, the traders would be looking at screens and madly punching buttons to make trades and would be h andling at most 4-5 stocks. Today, a post will handle 30 stocks and all the trading is automated, with the trader there for special situations, which didn’t seem to develop as I was walking around. The options floor of the American Stock Exchange has been squeezed into an alcove about the size of a floor of my apartment building. That is the entire options trading exchange. Most of the options are traded by computer, but when traders or investors are looking for something unusual or “in size” they can go to a specialist. During my 10 minutes of walking around, I actually heard one large, complex block trade, an option on the QQQs, being put together in the old-fashioned, open-outcry manner. Ten years ago there would have been a full-on constant buzz. I seem to remember three massive caverns filled with trading posts, which have been more or less pushed into one of the original rooms with lots of room to spare. You could set up a bowling alley in several of the lanes, as there was nobody walking in them. A lot of people recognized and stopped me, and we talked about the markets. Many of them had changed jobs several times in order to be able to stay on the floor. There is a certain romantic camaraderie that I would find enjoyable, I think. One of the big (and to me very sad) changes has been the ability of the exchange to deal with problems. In the “old days” Art could just walk around, and if he saw something that didn’t look or feel right he could literally halt trading until things got settled. While he could technically do that today, it wouldn’t do any good. Perhaps as much is 80% of the trading is actually done outside of the exchange floor, so halting trading on the floor would do nothing except disadvantage members. I think the day is going to come when we are going to miss having a sheriff walking the “city streets” looking out for the little guys. It’s time to hit the send button. Have a great week. We are supposed to get a lot more rain in our part of Texas, which I wish we could send west and south. Our lakes around here are finally full once again; and Texhoma (the largest in Texas), after being as down as far as I have ever seen it, is now full and threatens to overflow the dam. Have a great week! This week let’s take a look at current market valuations (high) and what they are telling us about probable 10-year forward returns (low). The stock market has had an outstanding five year run. With that, I believe, many individual investors have misguided expectations. The market is overvalued, over-believed and over-margined yet trend evidence remains positive and Don’t Fight the Fed an important theme. For now. I share some concluding thoughts below (please note: the piece prints longer than normal due to the number of charts). One of my favorite valuation measures is median PE. It is based on actual reported earnings (not Wall Street’s oft over-inflated forward estimates). This first chart shows median PE to be 21.5 (price times earnings) on April 30, 2015. The 51 year average median PE is 16.8. Note that in the upper left of the chart that the Median Fair Value (taking current earnings times 16.8) is a S&P 500 level of 1627.24. The market is at 2121 today and was at 2085.51 at April month end. Overvalued is measured at a 1 standard deviation move above Fair Value or S&P 500 level 2128. We are a long way away from undervalued or S&P 500 level 1126.29. The next chart looks at S&P 500 PE based on (normalized earnings). The current reading is 20.3. The data in the box in the upper left of the charts shows the S&P 500 Gain/Annum when this PE measure is above 16.5 (shaded grey). It shows that PE has been above 16.5 about 30.7 percent of the time since 1927 and over that time period the return averaged -0.5% when PE of 16.5 or higher. We are in a high valuation = low return zone. Stocks are richly priced. This next chart is said to be Warren Buffett’s favorite valuation measure. It shows the stock market capitalization as a percentage of gross domestic income. Simply take the total number of shares outstanding times price and compare that to U.S. gross domestic income. You can see that we are at a higher level than we were at the market peak in 2007. Only March 2000 was higher. The charts shows the market to be in “bubble territory”. Recently, Buffett mentioned that given where inflation and interest rates are, the market is not too overvalued. Fed Chairwoman Janet Yellen took a different view this week and said that U.S. stocks are “quite high”. The following is a clip from Bloomberg’s David Wilson in an email he sent me this week. Yellen referred to share valuations as “quite high” on May 6 at a financial forum in Washington. “Now they’re not so high when you compare the returns on equities to the returns on safe assets like bonds, which are also very low, but there are potential dangers there,” she said. “When an inflation overlay is included, P/Es don’t look as expensive.” The New York-based strategist cited data showing the S&P 500 ratio was 18 percent higher than the average regardless of CPI. If the above is true, then keep a close eye on interest rates. I think they’ve bottomed and will likely be higher two to three years from now. Don’t Fight the Fed and paying close attention to interest rate trends means everything here. Here is a different valuation take: one that looks at Price to Sales. Conclusion: “Market Expensive”. Lastly, I think the next summary is pretty cool. NDR put together a valuation dashboard. I see a lot of red. I mentioned that while PE is a poor foreteller of market peaks and troughs, it is good predictor of probable forward returns. Let’s look at that next. This next chart breaks median PE into five quintiles. I’ve previously shown a chart taking the data back to 1950; however, an astute advisor asked me what the returns looked like since 1984. Over this period of time, PEs tended to remain much higher than periods prior to 1984. The idea here is to divide all data points of PE since 1984 into quintiles and then see what the 10-year return was if your starting point was at any point in a given quintile. Quintile 1 is best (lowest 20% of PEs) and Quintile 5 is the most expensive (highest 20% of PEs). If an investor bought in when the market was inexpensively priced in Quintile 1, the annual return over the subsequent 10-year period averaged 15.91%. Conversely, if you bought in at any time median PE was in Quintile 5, the annual return over the subsequent 10-year period averaged 2.94% (note this is before inflation). The next chart takes a whole different look at probable forward returns. Interestingly, it looks at stocks as a percentage of total household equity ownership and tracks the subsequent 10-year return based on just how much equity individuals owned as a percentage of their total financial assets. The idea here is that when investors have fully committed to the stock market, most of the money is in the game – having already bid up prices. When low, most of the money is out of the game creating buying power that ultimately comes back in to drive prices higher. In short, the current data is telling us to expect returns over the next ten years of just 2.25%. Note the high correlation coefficient since 1952 (the dotted black line is the actual rolling 10-year returns). The top red arrow shows what actually happened to investors who bought at the market peak in 2000. The second red arrow shows the top in 2007 (note it has not yet been ten years so the dotted line stops). The yellow circle shows where we were at year end. Here too the story says to expect low returns. Finally, Jeremy Grantham and his team at GMO take a more dire view when forecasting the next seven years. In my view, so much hinges on the Fed and the overall market trend. I post this next chart from time to time in Trade Signals. It has been steadily deteriorating and while not yet at a -2 reading, it is just one step away. Click here for the full piece including charts. We are in an environment that favors a focus on absolute returns instead of relative returns. The problem is that the markets are doing their best to throw us a head fake and like 2000 and 2008, investors are biting on the move. Memories tend to be short lived. While sometimes that may be helpful in life, it is not helpful in investing. Don’t bite on the head fake! The reality is that valuation metrics are very poor at predicting a market peak. Don’t Fight the Fed remains in place and there are better ways to more accurately risk manage the market turning points. I’m a big fan of NDR’s Big Mo (for momentum), yet nothing is perfect. Fortunately, there are ways to inexpensively hedge that doesn’t require perfect. What we can do is fairly accurately predict forward 5- and 10-year returns. Here too, not perfectly but we can get pretty darn close. With the market richly priced, forward returns just don’t look good enough. Worth the risk? I think it’s better to have a game plan in place that enables you to capitalize on the next major market correction – which in my opinion could be in the -40% to -60% range. Recessions tend to happen once or twice in a decade. The Fed and the global central banks are in play but the Fed is nearing a change in plan. Play defense until a better opportunity presents. There are a number of things that can drive the market higher than we might imagine – a rush of foreign capital into U.S. assets driven from negative interest rates and a loss of confidence in government and bank safety in Europe. I think it’s a probable maybe. How’s that for confidence? It could happen. Exotic assets, and the crippling losses that big and indispensable financial institutions suffered after buying too many of them, bore much of the blame for the last financial crisis. The next one might have a more paradoxical cause. Instead of being overexposed to assets of dubious provenance, many of the same institutions may be buying too many of the assets that the authorities deem safe. They have no choice. Determined to prevent a repetition of the crisis, regulators are forcing the holders of $100tn worth of assets the world over to buy debt from the most creditworthy issuers: companies and sovereigns with pristine credit histories, which comfortably generate enough cash to cover their obligations. After so many banks were sucked down by doubtful debt lurking deep within their portfolios, the impulse to usher them on to firm ground is easy to understand. But corralling a huge amount of capital into a narrow band of the market drives prices to perilous highs. Even if these assets were safe to start with, the enforced concentration is enough to make them risky. Consider the Solvency II directive, which is intended to reduce the risk of an EU insurer becoming insolvent, and requires every such institution to hold a proportion of its assets in cash (or cash equivalents). Precisely what proportion depends on how safe regulators believe its other assets to be. Equities are deemed especially risky; insurers are required to put up cash amounting to 28 per cent of the value of their holdings, to guard against the chance that the shares will fall. Short-term bonds issued by companies with high credit ratings are deemed far less risky, and require cash holdings of just 3 per cent. Sovereign government bonds sometimes incur no cash requirement at all. Insurers are just the latest to face such regulations. Similar rules have been imposed on banks. Regulators require clearing houses and other intermediaries to hold more collateral than before — and it is the same small set of assets that count as collateral. Meanwhile, central banks in Britain, the US, Japan and now the eurozone have all conducted programmes of quantitative easing, intervening in markets to buy assets using freshly minted cash. In each case, they have favoured sovereign bonds. At the same time as regulated companies are being forced to buy these “safe” assets, then monetary authorities have been taking away large swaths of supply. The result is unprecedented: in the world’s bond markets, almost €5tn of assets currently trade at prices so high that the yields on them are negative, according to data from Thomson Reuters. Among them are government bonds issued by Germany, the Netherlands, Switzerland, Austria, Sweden and Denmark, as well as some corporate bonds, such as those issued by BP and Nestlé. Longer-dated bonds issued by European governments also attract low yields; as low as 0.077 per cent, in the case of 10-year bonds issued by the German government. Many observers argue that this is merely a temporary triumph of optimism. No one would buy bonds with yields near zero (or even lower) if they thought there was any prospect of inflation, unfavourable currency fluctuation, or anything else that might erode their value in the next five years. The exuberance will soon pass, these observers say, and yields will return to normal. It is an argument that would have merit if investors were acting voluntarily. But in many cases, their hands are being forced. You can define particular assets as “safe”, but you cannot wish away the list of economic and political contingencies that might some day cause large numbers of investors to dump them. If oil prices rise again, some borrowers will look less credit worthy. If one government defaults, investors might re-evaluate others. Serious doubts could return over the integrity of the eurozone. These assets are now so overvalued that they have little chance of rising further. What they do have is a lot of downside, and a lot of jittery holders. Speculators feed off such asymmetries. That may be why, in just 17 trading days between 20 April and 13 May, low-yielding bonds lost $0.5tn of their value. There was a similarly sharp sell-off last December; then the focus was US government bonds. These are tremors before the quake. Yet systemically important institutions are being forced to linger on the faultline. One pro thinks we’re in middle innings of bull market while a journalist sees stocks falling by 50%. So where’s the stock market heading? It’s a question that Barron’s writers and Wall Street professionals alike are used to hearing from readers and investors. When I get this question from friends and family members, I usually respond that the very question represents a misguided way of looking at the investment world. I mumble that no mortals, even ones equipped with CFA certifications and advanced degrees from Wharton and Harvard, can predict what the major indexes will do tomorrow, let alone a month or a year from now. So it’s simply best for investors, rather than betting on a bull or bear scenario, to come up with an asset allocation plan that is consistently with one’s investment time horizon and tolerance for risk and then rebalance every quarter or two. That answer, the financial-advice equivalent of “eat your organic broccoli, not your testosterone supplements,” never seems to silence the question: So where’s the stock market heading? Not surprisingly, smart people disagree daily on this question. And both often cite solid statistics to back up their radically different points of view. One popular article on Barron’s right now is an interview with Jeffrey Saut, the respected chief investment strategist with Raymond James. He reminds investors who think that the six-year-old bull market may be long in the tooth that the overall 1982-to-2000 secular bull market lasted for almost two decades. “So I have seen this play before, and secular bull markets tend to last somewhere around 14 or 15 years,” he tells Strauss. Over the weekend, as readers were digesting Saut’s comments, a piece appeared on Business Insider by the site’s president and top editor Henry Blodget calling for stocks to drop rather radically. “As regular readers know, for the past ~20 months I have been worrying out loud about US stock prices,” writes Blodget. “Specifically, I have suggested that a decline of 30% to 50% would not be a surprise. So has this market bear been selling off his stocks? After all, that would be placing his money where his writing is. Now I know that there will be many readers who will criticize me for quoting the opinions of Blodget, a former star Merrill Lynch analyst who a decade ago agreed to a lifetime ban from the securities industry after regulators discovered that he wrote private emails disparaging stocks that he was bullish about in public. And one has to think a bit less of Blodget’s convictions on this bearish call since he isn’t selling off any of his holdings. Merely stopping a dividend reinvestment plan is hardly the behavior of a courageous bear. Of course, I would be more nervous about stocks if Blodget were actually selling off his index fund or perhaps even shorting it to profit when his scenario comes to pass. It looks like even Henry isn’t entirely convinced that the good times will end son. It is half-time in the match between the US justice system and Fifa. In the first half, the Americans took a shock early lead, with the unexpected arrest of several of Fifa’s leading players. But world football’s governing body struck back with a defiant equaliser — re-electing its discredited president, Sepp Blatter. The ultimate outcome of this match will be of interest all around the world, and not just to football fans. President Vladimir Putin of Russia has denounced the Fifa arrests as yet another example of the abuse of American power. His reaction illustrates that the Fifa struggle has become a highly visible test-case of one of the central questions in world politics — is the US still powerful enough to call the shots in global organisations? Or is the sole superpower’s grip on global institutions slipping? Fifa, of course, is a niche organisation. But the same questions of whether ultimate power still lies in the west applies to much more systemically important global institutions such as the International Monetary Fund, the UN and its sub-organisations including the UN Human Rights Council. It is also increasingly a question in the network of non-governmental organisations that provide the wiring for the world economic system; from Swift, the organisation that handles international financial transfers between banks, to Icann which regulates the internet. Until last week, Fifa looked like the archetype of an international organisation that was slipping out of the control of the west. Bids to stage the 2018 and 2022 World Cups from England, Spain, the Netherlands, the US and Australia had been rejected in favour of Russia and Qatar. The western press was full of accusations of corruption at Fifa. But Mr Blatter and his acolytes brushed them aside. The dramatic arrests in Zurich changed this picture of western powerlessness. This was something that only the US could or would do. Switzerland has launched its own investigation but is unlikely to have acted alone, without prompting from the FBI in ­Washington. But what allowed America to act in this way? Is that US power transferable to other domains? And is it slipping? One key fact is the centrality of the American financial system to the world economy — something that in turn rests on the importance of US-based banks and the role of the dollar as the pre-eminent global reserve currency. The US has standing in the Fifa cases because allegedly corrupt transactions were made through banks operating in the US. On other occasions, it is not just the direct use of the US financial system that drags outsiders into America’s net. Some US sanctions regimes force foreigners to obey American law, even outside the US, or to be subjected to sanctions themselves. Swift, for example, is based in Belgium and was compelled to disconnect Iranian banks by EU laws. But had Swift’s directors refused to obey US sanctions on Iran, they would have risked being refused entry to America. Could this change? Possibly. But it would probably require the Chinese currency to become a global reserve currency to rival the dollar. That is why the IMF’s decision later this year about whether to include China in the basket of currencies from which it makes up its special-drawing-rights will be keenly watched. Such a move would be a visible step along the road to turning the renminbi into a global reserve currency. That, in turn, might ultimately threaten the dollar’s unique global position — and the power that it confers on the US. The US may oppose any IMF move to elevate the status of the renminbi. It will have to tread carefully, however. Opposition that was based on the fact that China’s currency is not yet fully convertible could well be seen as legitimate. Opposition that looked like little more than an unjustified effort to hang on to a privileged position could end up weakening the US. For the final lesson of the Fifa affair is that America’s power does not just rest on the size of its market or the power of its military. Its justice system also still possesses a moral authority that stems from its roots in an open, democratic and law-governed society. The justice dispensed by the US system can seem rough, particularly given its use of threats and plea bargains. But if the US Department of Justice says there is a serious case to answer, it still carries global credibility. The same benefit of the doubt would not be extended to a prosecutor in Moscow or Beijing. China is certainly closing the wealth gap with America, just as Asia is closing the gap with the west. But the reputation of American institutions for integrity remains a vital intangible asset. It is that reputation that allowed the US to tackle Fifa. OXFORD – When a US Navy P8-A surveillance aircraft recently flew near Fiery Cross Reef in the Spratly Islands in the South China Sea, it was warned eight times by the Chinese Navy to leave the area. Chinese Foreign Minister Wang Yi said that, “China’s determination to safeguard its sovereignty and territorial integrity is as firm as a rock.” US Defense Secretary Ashton Carter replied that, “[T]here should be no mistake about this: the United States will fly, sail, and operate wherever international law allows us, as we do all around the world.” So, is a US-China conflict in the South China Sea imminent? In 1995, when I was serving in the Pentagon, China began building structures on Mischief Reef, which is claimed by the Philippines and lies much closer to its shores than to China’s. The US issued a statement that we took no position on the competing claims by five states over the 750 or so rocks, atolls, islets, cays, and reefs that comprise the Spratlys, which cover a vast area – 425,000 square kilometers (164,000 square miles) – of the South China Sea. We urged that the parties involved settle the disputes peacefully. But the US took a strong stand that the South China Sea, which includes important sea lanes for oil shipments from the Middle East and container ships from Europe, and over which military and commercial aircraft routinely fly, was subject to the United Nations Law of the Sea Treaty (UNCLOS). To back up its territorial claim, China relies on a map inherited from the Nationalist period – the so-called “nine-dashed line,” which extends nearly a thousand miles south of mainland China and sometimes as close as 40 or 50 miles from the coastline of states like Vietnam, Malaysia, Brunei and the Philippines. All of these states claim the 200-mile exclusive economic zones granted under UNCLOS. When the dispute over Mischief Reef erupted, Chinese officials failed to clarify the meaning of the nine-dashed line, but, when pressed, they agreed that the dashes demarcated areas where China had sovereign claims. At the same time, they agreed that the South China Sea was not a Chinese lake, and that it was governed by the UN treaty. On this basis, the US and China avoided conflict over the issue for nearly two decades. But China did not avoid conflicts with its maritime neighbors. Although it pledged to adhere to a code of conduct negotiated by the Association of Southeast Asian Nations in 2002, it used its superior military might in disputes with the Philippines and Vietnam. In 2012, Chinese patrol vessels chased Philippine fishing boats away from Scarborough Shoal off the Philippine coast, and the Philippine government has taken the dispute to the International Tribunal for the Law of the Sea (ITLOS), which China claims has no jurisdiction. In 2014, after China stationed an oil rig in waters claimed by Vietnam, ships from the two countries engaged in ramming and water-cannon battles at sea; anti-Chinese riots in Vietnam followed. The region’s smaller states sought American support. But the US remained careful not to be drawn into the competing claims over sovereignty, some of which are tenuous, while on others China sometimes has a stronger legal position. Moreover, the US had to focus on larger issues in its relationship with China. China correctly declared that it was within its sovereign rights to dredge, and that it was merely following the lead of its neighbors, whose governments had also been creating structures to bolster their claims. But American suspicions were heightened by the fact that in 2013, in a separate dispute between China and Japan over the Senkaku/Daiyou Islands in the East China Sea, the Chinese government unilaterally declared an Air Defense Identification Zone without prior warning. The US response was to fly two B-52 bombers through the unrecognized zone. This set a precedent for the recent naval reconnaissance flight (which had a team of CNN reporters on board). The US response was designed to prevent China from creating a fait accompli that could close off large parts of the South China Sea. Nevertheless, the original policy of not becoming embroiled in the sovereignty dispute continues to make sense. The irony is that the US Senate’s failure to ratify UNCLOS means that the US cannot take China to ITLOS over its efforts to convert reefs into islands and claim exclusion zones that could interfere with the right of free passage – a major US interest. But, because China has ratified UNCLOS and the US respects it as customary international law, there is a basis for serious direct negotiation over clarification of the ambiguous nine-dashed line and the preservation of freedom of the seas. With properly managed diplomacy, a US-China conflict in the South China Sea can and should be avoided. Greece and its European creditors have both issued “last ditch” demands in their bail-out talks that appear incompatible, raising the stakes in an increasingly dangerous showdown. The eurozone’s negotiators and the International Monetary Fund have been putting the finishing touches on what amounts to a package of take-it-or-leave-it conditions that offer scant leeway on Greece’s austerity or debt relief. It is understood that the proposals offer no real concessions on Greece’s “red lines” on pensions and labour rights. The creditors have promised a degree of flexibility but continue to insist that the far-Left Syriza government comply with the chief sticking points of the old EU-IMF Troika”Memorandum”. Alexis Tsipras, Greece’s prime minister, pre-empted the move by rushing through his own set of proposals, more or less conceding in advance that his plans will not be accepted by the technocrats. “The decision now lies with the political leadership in Europe,” he said. Mr Tsipras seemed determined to show that Greece is still the master of its fate, if only before his own people. “We are not waiting for them to submit their own plan back to us. Greece is the one that submits the plan,” he said. Huw Pill, at Goldman Sachs, said a sovereign default along with a freezing of bank deposits and a parallel scrip currency or IOU are increasingly likely and may even be “necessary” to break the impasse. “The platform on which the current Greek government was elected is simply infeasible. The Greeks cannot have their cake and eat it. A hard choice has to be made between a euro exit and an adjustment to remain part of the single currency,” he said. Mr Pill said the country now faces such an acute crisis that it may soon be forced into policies that hurt its core supporters for the first time, changing the character of the Greek political drama. “As the liquidity squeeze intensifies and cash reserves are exhausted, the (creditor) seniority enjoyed by pensioners and public sector workers evaporates. Being first in the queue does not help when there is no cash left,” he said. Whether Mr Tsipras will in fact retreat in order to keep Greece in the euro is far from clear. He threw down the gauntlet in a blistering article in Le Monde on Sunday, accusing the creditors of making “absurd demands” and asphyxiating democracy in Europe. Mr Tsipras alleged that the EU powers wish to “make an example out of Greece” so that no other country will dare defy the austerity regime or the “doctrines of extreme neoliberalism”. While the language was Marxist, his threat to default and detonate a strategic crisis in Europe was wickedly Byzantine. “If some, however, think or want to believe that this decision concerns only Greece, they are making a grave mistake. I would suggest that they re-read Hemingway’s masterpiece, For Whom the Bell Tolls,” he said. Yannis Dragasakis, the deputy prime minister and normally a conciliator, issued his own warnings in a series of tweets on Tuesday morning. “We will not accept ultimatums nor succumb to blackmail,” he said. Mr Dragasakis said Greece cannot withstand further austerity and insisted that Syriza will not accept a deal unless the target for the primary budget surplus is cut to 1pc of GDP in 2015 and 1.5pc next year. The eurozone wants a medium-term surplus of 3.5pc. While the creditor bloc has tried to maintain a unified front, it is riven with differences. The German coalition itself is deeply split, with the Social Democrats (SPD) expressing open irritation with hardliners in the German finance ministry. Sigmar Gabriel, the SPD leader and German vice-chancellor, said the world would lose all confidence in Europe if the EMU project broke apart in its first big crisis. He warned that consequences of a Greek bankruptcy would be “gigantic”. A quintet of key figures held an emergency meeting in Berlin on Monday night to thrash out an emergency position as time runs out. Hosted by German chancellor Angela Merkel, it included French leader Francois Hollande, the heads of the European Central Bank and Commission, as well as Christine Lagarde, head of the International Monetary Fund. They broadly agreed on a technical paper drafted by the Commission, but that in itself solves nothing. Eurogroup chief Jeroen Dijsselbloem played down any hope of a deal this week, leaving it unclear what will happen on Friday, when Greece must pay the IMF €300m (£218.3m). There is a growing concern that much of the Syriza leadership – and possibly Mr Tsipras himself – has already concluded that a deal on tolerable terms is impossible, and may be resigned to default and a return to the drachma rather than betray their cause. If so, the strategy at this point is to try to justify a final rupture by persuading Greek public opinion that Grexit was forced upon them. Gabriel Sterne, at Oxford Economics, said the prevailing narrative that Syriza keeps making mistakes and is drifting towards disaster is “half-baked and superficial”. It assumes that Mr Tsipras wishes to remain in the euro at all costs and is therefore likely to capitulate in the end. Yet he may equally have concluded a return to the drachma might not be so bad and that he will pay an even higher political price if he abandons his election pledges. Mr Sterne said there is “universal anger over creditor treatment” in Greece. While there are many opinion polls, the one that matters may be a survey showing that 58pc of Syriza voters would rather return to the drachma than submit to Troika policies. Let us all grab the reins on the dollar. Yes, it is true: the buck is up some 25% from a year ago, and at the highest level in more than a decade. After retracing recently, the dollar index has been chugging higher again although it has yet to penetrate recent highs. But put this all into context. In the early 1980s, the dollar index exceeded 160 before dropping nearly by half. A subsequent rally into the early 2000s was a 50% rally from the lows and took the index to 120. This latest rally is a clear third place, but also a distant third place (see chart, source Bloomberg). We can probably draw some instruction from reviewing these past circumstances. The rally of the early 1980s was launched by the aggressively hawkish monetary policy of Paul Volcker, who vowed to rein in inflation by restraining money growth. He succeeded, and took core inflation from nearly 14% in 1980 (with the dollar index at 85) down to 4.5% in 1985 (with the dollar index at 160). If you make a thing, in this case dollars, more scarce, its price rises. An optimistic press wrote about the “Superdollar” and the return of that signature American optimism. Well, one out of two isn’t bad. The dollar soon slipped back, as other central banks instituted similar monetary restraint and the relative advantage to the greenback faded. It bounced around until the late 1990s, when Congress attacked the federal deficit – actually turning it into a surplus in the late 1990s. The dollar rallied fairly steadily from 1995 until topping out between late 2000 and early 2002, thanks to aggressive easing action from the Fed which took the Fed Funds target rate from 6.5% to 1.0%. But it is important to remember that with currencies, it is all relative. If everyone is easing or everyone is tightening, then there shouldn’t be much in the way of relative currency movements. Thus, even though the Fed has spent most of the last seven years doing quantitative easing, the dollar hasn’t done much on net because everyone else is doing so as well. All currencies should be cheapening relative to real assets (and are, with respect to real estate, but not so much with commodities…for reasons that make little sense to me), but not relative to one another. But recently, the dollar has outperformed because the investing community collectively perceived a divergence in monetary policies in the offing. While Japan and Europe have been ramping their QE higher, the Fed has ended its QE and at least some people expect them to raise rates soon. If it were to actually happen that money growth in Japan and Europe continued to accelerate while it slowed in the U.S., then it makes perfect sense that the dollar should appreciate. That is happening a little: the chart below (source: Bloomberg) shows that in the most recent data, European M2 money growth exceeded US M2 money growth (as well as UK and Japan M2 money growth) for the first time since 2008. Look at that spike on the red line in the chart below! On the other hand, there doesn’t seem to be anything dramatic happening on that chart, with all growth rates between 3.5% and 6.1%. And, honestly, I think investors have it generally wrong in thinking that if the Fed hikes US interest rates, money growth should slow and overall monetary conditions should tighten. Quite the contrary: I believe that with enormous excess reserves in place, rising interest rates will only spur bank interest in lending, and money growth will not slow but may even increase. But in any event, dollars are not about to become more scarce. The Fed doesn’t need to do any more QE; the vast quantities of excess reserves act as a reservoir of future money. I have been surprised by the dollar’s rally, but unless something changes in a more serious way I don’t expect the rally to end up resembling the two prior periods of extended dollar strength. Rising prices aren’t the same as growth. The eurozone’s return to something resembling inflation might create the impression that the European Central Bank’s monetary maneuvers are working. Headline inflation rose to 0.3% year-on-year in May from zero in April, and so-called core inflation rose to 0.9% from 0.6%—higher than before, although well short of the ECB’s target of close-to-but-less-than 2%. These numbers need a few asterisks. 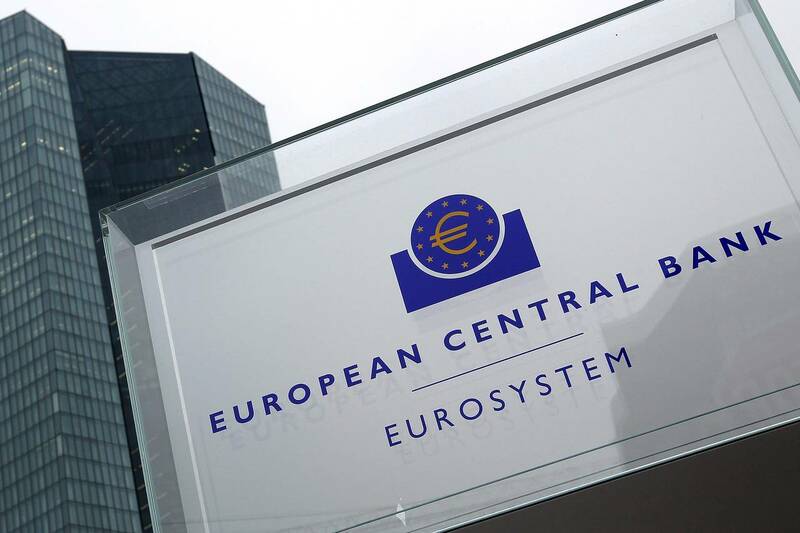 Cheerleaders for the ECB’s sovereign-bond-purchase program, or quantitative easing, point to some caveats suggesting the central bank should keep QE running at full tilt. Roughly one-third of the pick-up in headline inflation came as oil prices stabilized, creating less energy-price deflation. The causes of the rest of the price uptick—mostly chalked up to 1.3% service-price inflation—remain obscure, although odd factors such as the prices of package holidays in Germany may have played an outsize role. The QE crowd is right that inflation is not entrenched, and the ECB is expected to stay the course on bond purchases at its meeting Wednesday. The more worrying caveats are all the other ones. Many economic indicators are anemic at best. Unemployment is falling but not fast enough: On current trend it will take a decade for unemployment to return to its pre-2008 lows, according to economists at the investment bank Berenberg. Growth in Germany, the eurozone’s largest economy, was relatively strong early this year but is faltering as exports have failed to roar back. Strong employment numbers there mask widespread underemployment as hours worked per employee are still below pre-2008 levels. Business sentiment around the eurozone is either stuck in neutral or isn’t positive enough to fuel the economic growth Europe needs. This is an echo of Japan, where two years of QE have contributed to some inflation but little growth. Japanese households are paying higher prices for imports in particular, while employment and wages never picked up. At least Europe embarked on its monetary experiment as energy prices were falling, which is one of the best things to happen to the eurozone in recent years. ECB President Mario Draghi presumably knows the problem, since he’s been the first to remind European leaders that monetary policy is no substitute for the labor-market, tax and regulatory reforms Europe needs. The danger is that reports of QE “working” will free policy makers from a sense of urgency over reforms. Petrobras plans to sell 100-year bonds. Investors may want to look at the recent performance of a similar issue from Mexico. How long is a century? That may depend on who it is issuing a 100-year bond. Brazilian state-run oil company Petrobras PBR 5.97 % , mired in a corruption scandal, filed plans Monday to issue century bonds denominated in U.S. dollars. Aside from Petrobras’s and Brazil’s own woes, buyers will have to weigh the risk inherent in such long-dated bonds. 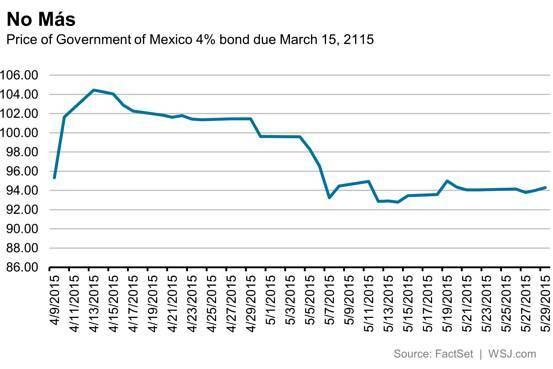 Mexico helpfully provides an example of how quickly the view of such debts’ value can change. That country issued a 100-year euro-denominated bond in early April, just before global bonds threw a tantrum. That was initially snapped up due to the global hunt for yield caused by ultraloose monetary policy. The fact investors had such a hankering for it, even though the bond only had a 4% coupon, shows just how thirsty for yield markets really are. The catch is that long-dated debt can be very sensitive to moves in interest rates. Bond math alone means the shine can quickly come off such issues. Petrobras, besides its legal travails, is subject to the vagaries of the oil price, fluctuations in the reais, and Brazilian politics. The company has been at pains to say it isn’t considering a dilutive sale of new shares to shore up its highly stretched balance sheet. It may see issuing very long-dated debt as a way to square that circle. Given such issues, though, Petrobras will have to offer investors higher returns than Mexico. Initial talk puts the yield at around 8.85%. Even then, buyers may find a century is a very, very long time, indeed. This has occurred along two tracks. First, stricter regulation has led banks to cut capital devoted to intermediation, making liquidity more precious. Each unit of risk demands a larger amount of capital than in the past. As a result, volumes at a given price decline. In periods of stress, there is little liquidity on offer at a given price. If everyone wants to sell simultaneously, prices can move a lot more than standard risk models assume. Second, new forms of liquidity providers have stepped into the void, with automated trading platforms particularly evident in developed bond markets. But unlike the banks of old, which warehoused securities on their balance sheet, the new providers are more skittish. Liquidity provision is prone to shift suddenly from feast to famine, and in turn, the instances of lightning strikes proliferate. The good news is that, despite bouts of illiquidity, markets today are less fragile than in the past as financial system leverage has been reduced substantially. The bad news is there has undoubtedly been some negative impact on the price and quantity of credit provision. The open question is whether the changes have made markets more susceptible to shocks and prone to fragmentation. As the exit from zero interest rates approaches in the US and the UK, this question is of paramount importance. The fixed income market operates like a beauty contest: when returns are strong, as they have been in the post-crisis era, money flows in. In periods of negative performance, money flows out. And since three-quarters of all instances of outflows from fixed income funds over the past 21 years have occurred during Fed tightening cycles, the risk of outflows when rates rise is high. Today, a larger swatch of the fixed income market is subject to beauty contest risk. Because credit spreads are so tight and “safe” sovereign bond yields so low, the buffer against any capital loss on bonds is extremely thin. A small rise in interest rates can generate losses across a large area of the fixed income market. Add to this the dearth of market-making liquidity and the riskier fringes of the credit market are likely to become dislocated. Markets always fear a big sell-off, but does the current market structure problem pose a material risk to financial stability? For developed markets, as long as asset managers are leverage-constrained, the maturity mismatch inherent in daily liquidity funds poses modest risk to asset owners and their agents, the asset managers. Global warming in financial markets may lead to more “taper tantrum”-like events. But even if there is a genuine bear market in bonds, discontinuities should be bearable as long as there is sufficient transparency in pricing. For emerging markets, the outlook is less encouraging and reflects the dangers of looking at the market liquidity problem purely from the perspective of the lender/investor. The maturity transformation into illiquid corporate and local currency fixed income investments creates a risk of sudden stops. The taper tantrum resulted in nine months of outflows from emerging market fixed income funds — and this was when the Fed was still easing policy. Imagine a material tightening in US monetary policy and it becomes difficult to see how many emerging market corporates and even some sovereign borrowers cope. The same benefits to fixing the market ecosystem apply, but there are costs to having waited so long to address the issue. Any problems stemming from market liquidity challenges are likely to show up in emerging markets first. The policy changes needed to address market liquidity imbalances are relatively modest, but urgent. Volatility and market dislocations, already a constant feature of the post-crisis landscape, are only likely to worsen as additional bank regulation kicks in. Redefining what constitutes a liquid asset, upgrading pricing tools for illiquid securities and removing the subsidy of daily liquidity will go a long way toward preventing central banks from becoming a hostage to these ongoing changes in the market ecosystem. MONTREAL — Last week, world soccer’s governing body, FIFA, again proved its knack for producing compelling spectacles that glue millions to their TV screens. But this time, rather than Messi and Neymar, the show starred the Swiss police, America’s attorney general and Sepp Blatter, FIFA’s wounded but unbowed chief, as he fought to keep his job even as 14 of his top lieutenants faced U.S. indictments under RICO: the anti-racketeering law originally designed to fight the Mafia. The danger is that the breathtaking venality laid bare in the Justice Department’s indictment will lull us into thinking a change of personnel is all it will take to reform FIFA. The problem goes much deeper: FIFA’s structure is corrupt to the core. Even if Mr. Blatter is somehow shoved aside or jailed, without radical reform, corruption will only sprout again under a different capo. The root of the problem, as Carl Bialik has observed, is FIFA’s “One Country, One Vote” rule for making most major decisions. It gives small countries hugely outsized influence over the organization, influence out of all proportion to their interest in or contribution to the game. Just think, 5,257 times more people play soccer in Germany than in Bhutan, but both Germany and Bhutan each get one vote. One Country, One Vote is an absurd rule that Mr. Blatter has deftly manipulated to create a stranglehold over the game. By pouring patronage into tiny countries’ football infrastructure, Mr. Blatter has created an unbreakable web of cronies at National Soccer Confederations around the globe. A few hundred thousand dollars spent on a physiotherapy center building in Tahiti, or on a soccer pitch in the Comoros locks in those countries’ votes at the FIFA Congress. It’s a coalition of these micro-states that keeps re-electing Mr. Blatter, and will continue to in perpetuity, as long as One Country, One Vote is the rule. That’s why reform efforts need to go beyond the call to get rid of Mr. Blatter and his cronies, and look at sensible ways to represent countries proportionally to their commitment to the game. The solution is clear: One Player, One Vote. Voting should be weighted by the number of players, amateur and professional, officially registered with a country’s soccer federation. It would be something like America’s electoral college, where each state has a voice in presidential elections, but big states speak louder than others. The result would be a major shift in power to countries where people really play the game. Nor would the change benefit just European countries: South Africa, with its 1.4 million registered players, would suddenly have 175 times the voting power of Latvia, where just 8,385 people play. And while Vladimir Putin has been no fan of the recent moves against FIFA, even he might wonder why Russia, with its 847,000 registered players, shouldn’t have a louder voice around the table than Kuwait, where just 2,200 people play the game regularly. Such a shift would change incentives for Football Association officials all around the world: Suddenly, the way to increase your power would be to sign up as many new players as possible, and to keep them playing the game. In many places, the easiest way to achieve that would be to attract women and girls to the pitch, where they’re often grossly underrepresented. should be doing: Making sure a multibillion dollar commercial juggernaut encourages participation at the grassroots level, rather than bankrolling lives of luxury for bureaucrats in lands where nearly no one plays the game. 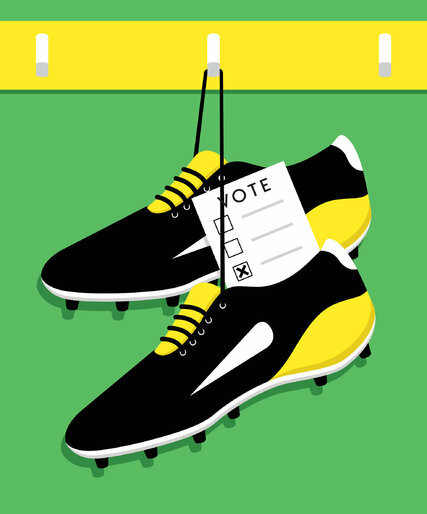 One Player, One Vote would empower the countries most dedicated to soccer to make the big decisions. The 12 biggest countries (Germany, the United States, Brazil, France, Italy, England, South Africa, the Netherlands, Japan, Russia, Canada and China) would, together, account for over 60 percent of the votes. That would be more sensible than the current system, where, in an association with 209 members, 50 percent of the votes go to 105 countries that are home to just 2.2 percent of the world’s soccer players. The biggest obstacle to this common-sense reform will be persuading FIFA to adopt it. The organization is so shot through with corruption that it can’t stop itself from re-electing Mr. Blatter, even with the F.B.I. knocking at the door. Under current rules, the 105 smallest associations have the votes to block any reform that would abruptly throw them off of the gravy train. It’s hard to conjure up a scenario that would induce Curacao’s soccer federation to vote itself out of numerical parity with Brazil’s. It may well be that FIFA cannot be reformed from within. The events of the past few days, with FIFA doubling down on Mr. Blatter even as the European federation chief, Michel Platini, threatened a walkout from FIFA, certainly point in that direction. Perhaps real change will require the collapse of a fatally flawed organization and the rise of a new governing body willing to adopt One Player, One Vote. It sounds radical, but it has happened before. International tennis competitions used to be organized by the International Tennis Federation until the players mutinied and essentially supplanted it with their own organization, the Association of Tennis Professionals, which is now the sport’s world governing body in all but name. FIFA could carry on in vestigial form, applauding a centenarian Mr. Blatter as members pay bribes to one another in empty banquet halls while corporate sponsors like Visa and Coca-Cola flock to a new organization supported by the world’s top players and the nations where they play. But for the sake of the game so much of the world loves, Mr. Blatter’s FIFA must never again be allowed to organize a major championship. That can only happen if some of the major footballing powers and their players take the plunge, and make good on the threat to secede from FIFA. Francisco Toro is the founder of the blog CaracasChronicles.